Last week's NYT opinion piece "Relax, You Don't Need to 'Eat Clean'" by Aaron E. Carroll prompted me to think about our society's dysfunctional relationship with food. Over the years, we have attached a moral code to foods based on an imperfect science. (A science that studies the trillions of molecules interacting inside of our bodies. Easy peasy, right?) There are "good foods" and "bad foods" and we are conditioned at an early age to feel good/bad based on which foods we eat. Fear, Mr. Carroll argues, is the basis of our society's diet. And I would have to agree. We live in a society where news channels are a barrage of terrifying nutrition news, each segment a harbinger of death. "You eat that food? Well, studies now show that you're now going to have a heart attack...in the next 5 minutes. Better luck next time!" "X, Y, or Z is going to give you cancer. Get it out of your diet now!" "NOW margarine is THE WORST for you. Go ahead and have that butter." We are a culture obsessed with lowering risk factors. And yet, the behaviors we make as human beings all come attached with degrees of risk. Your risk of dying in a car accident increases every time you drive your car. And yet, the majority of us accept and take that risk multiple times a day. But for some reason, that risk (which, if your curious, is 1 in 645 for your lifetime) does not carry nearly as much weight as the risk of developing heart disease or diabetes. My point is NOT to say "f*** it, eat bacon." My point is that we put SO much stress on being the "perfect" risk-free, 100% healthy humans, that it becomes unhealthy. Historically, food has been a source of nourishment and enjoyment. It unites cultures and families, binding them with traditions and collective memories that get passed down from generation to generation. It brings people of all walks of life together under the common theme of "OMG. Aunt Susan. This pie is AMAZING!!" Truth is: none of us is getting out of here alive. 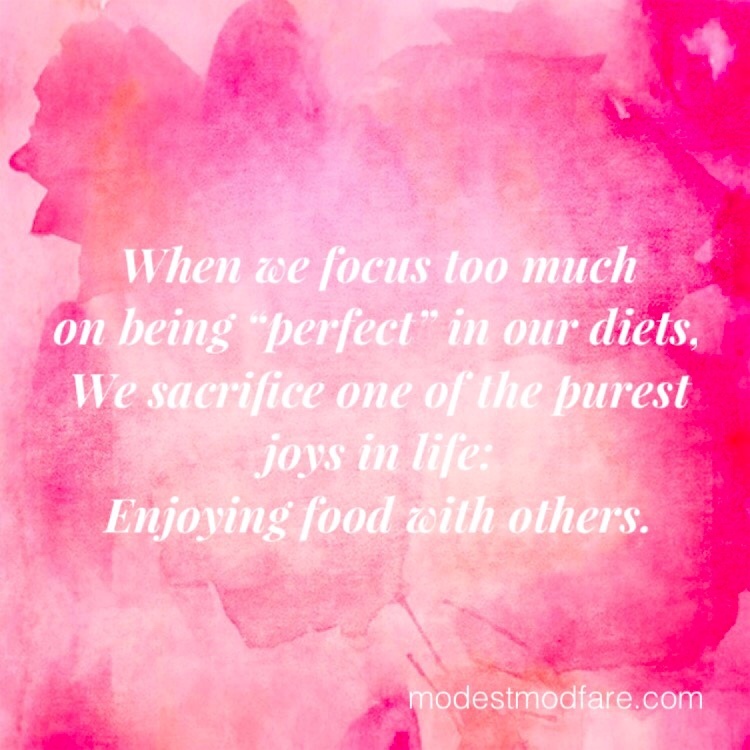 When we focus too much on being "perfect" in our diets, we sacrifice one of the purest joys in life: enjoying food with others. And even if you make it to be 100 years old and healthy as a horse, would you want to look back on your life and realize that instead of being saturated with comfort and joy, all the meals of your life were filled with anxiety, guilt, and dread? I am so interested in hearing your thoughts on this topic! Please comment below!